Progress is impossible without change, and those who can't change their minds can't change anything. Nothing can stop the person with the right mental attitude from achieving his goal; nothing on earth can help the person with the wrong mental attitude. Raise courage and moral strength to retain social values; to rise in life. In the present era, science has made rapid progress in the field of "Technical Education & Technology" to support Industrial development for the welfare of human society. We are required to understand its progress in a cool and calm mind. There lies the key to success if we adhere to hard-work with a positive attitude, self-confidence and sincere efforts. Self-labour and self-confidence yield time provides satisfaction in life and creates favourable work-culture to learn the social engineering for humanity concept. Our horizon needs to be broadened to accommodate diversified theories and emerging ideas. The spectrum of our thought should push the boundaries of our observation for better clarity, understanding and a fresh perspective of anything new and useful to human society. Roland Group of Institutions has been growing steadily due to the high learning attitude of our students and their cooperation to fulfil the Vision and Mission of our Management. We have many reasons to smile. The innovation, patience and constant efforts of our faculty, staff and administration have been a great help to establish the credibility of technical education through the eye-catching success of our dear students in many respects towards their objectives. The remarkable achievements of our students will definitely reflect through our constant efforts towards progress. Dear students, expand your creative quotient in order to do better every time. You are your own competitor. Compete with yourself to increase the core competence that will award you a new and meaningful dimension to your career to live a prosperous life. The most successful people in life are generally those who have the best information. Make your efforts multifaceted to improve the quality of your surroundings to enjoy the taste of happiness and satisfaction. You are your own architect. You are the budding engineer. You are wonderful technocrat. Make yourself visible through skills, abilities and proactive nature. Success is a Science; if you have the conditions, you get the result. Success is dependent on effort. Make sincere efforts to achieve cheerful moments of success in life. 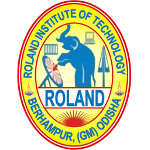 Be proud to be a RITIAN, being a student of Roland Institute of Technology, Berhampur-761008. Help the Indian Nation to occupy the distinguished position in the World.